RSTG has an established reputation as a leader in voice-over-IP (VoIP) design and deployment. Leveraging our Digium dCSE, dSSE, dCSP, dCAA, and Asterisk dCAP certified engineers and VoIP designers, RSTG is well positioned to design, sell, deploy and service an entire VoIP solution for your company. Utilizing a consultative approach and armed with years of experience, RSTG works with your key stakeholders to design your new VoIP phone system from the ground up. Layout of extension plans, multi-site least-cost-routing, failover dialing, enhanced 911, and sophisticated interactive voice response (IVR) are just a few of the issues that need to be discussed in order to create the perfect voice platform that meets the needs of your organization. From foundational network analysis to wide-area connectivity testing and verification, RSTG leaves nothing to chance with your phone system deployment. We can work with your existing IT staff to identify potential issues, both inside and outside your network, which could be a barrier to successful implementation of a VoIP phone system. To avoid these potential problems, we then plan and implement issue-mitigation strategies, paving the way for your new system. By implementing VLANs to segregate your voice traffic and utilizing QualityofService (QoS) at key critical points of your network, we ensure that your voice traffic receives all of the priority on your network that it needs to function correctly. If your company does not have the budget for a full “forklift” upgrade, RSTG can integrate VoIP into your legacy phone system, utilizing best-in-class hardware and software solutions, while paving the way for a smooth migration to a complete VoIP solution. Our previous VoIP projects range from small, single-building designs to large, multi-campus educational environments with hundreds of extensions. With programming and engineering talent with both the commercial Switchvox products as well as the open source Asterisk platform, RSTG has the capacity to design and build a comprehensive VoIP solution that meets your business needs now and in the future. Utilizing the power of Asterisk, RSTG engineers converted a call center with over 900 inbound phone lines to a complete VoIP solution, saving the client nearly $1M in the first year post installation. Who Uses Digium Phone Systems? 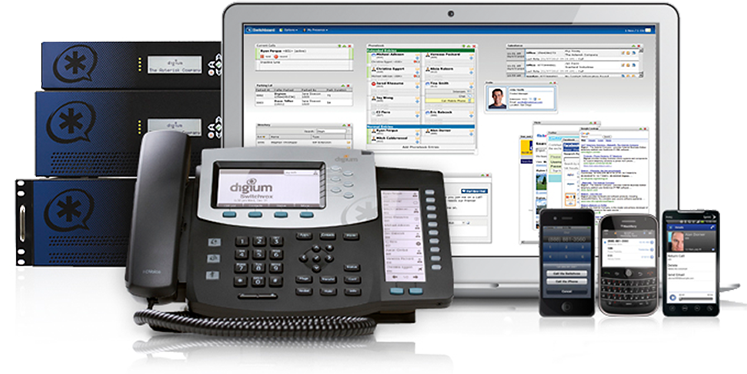 Thousands of companies in more than 170 countries around the globe have installed and use Digium phone systems. Companies like Yahoo, University of Pennsylvania, the U.S. Army, Google, Ashley Furniture, eBay, and the Girl Scouts of America rely on Digium for their communication needs.